Based on Seatools’ extensive experience and knowledge regarding heave compensation systems, the company introduces an intelligent active heave compensation module: HeaveMate®. This active heave compensator is an easy-to-integrate system for both new as well as existing offshore and subsea equipment such as winches, cranes, and LARS systems. HeaveMate® can be delivered either as an OEM package with the essentials for heave compensation (black box controller with sensors and software) or as part of a complete turn-key system, including mechanical and hydraulic hardware. 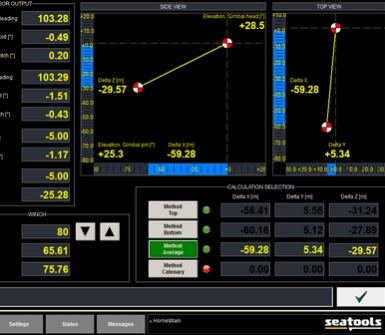 In any case, Seatools’ simulation capabilities are applied to ensure proper performance of the overall system in any sea condition and situation (incl. failure cases), and pre-tune the controller prior to commissioning, thus saving valuable vessel time. The system is currently deployed in a retrofit project in which a passively compensated LARS will be upgraded towards an actively heave-compensated LARS. WOULD YOU LIKE TO DISCUSS YOUR PROJECT WITH OUR EXPERTS?